Pegasus Health (Charitable) Ltd is a primary care network performing the function of a Primary Health Organisation (PHO), as well as supporting general practices and community based health providers within Canterbury to deliver quality health care to over 445,000 enrolled patients. Since our beginnings in 1992, we have been committed to improving the health outcomes for the people of Canterbury. Our innovations continue to lead health service design and delivery across the country and internationally. 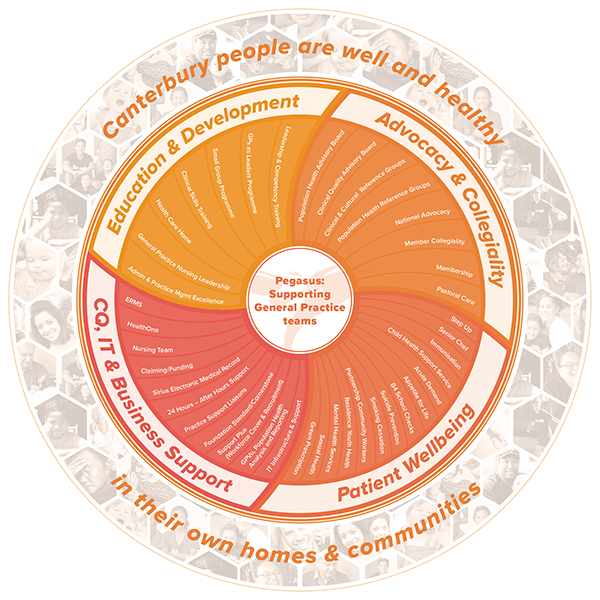 We are part of the Canterbury Clinical Network and work closely with a range of organisations, including the Canterbury District Health Board and other alliance partners, to enable the delivery of primary health care to the community and to assist in the continuous improvement of our wider health care system. We provide a range of services for the community focused on improving the health and wellbeing of our population and provide essential 24 hour care, 365 days per year for the population of Canterbury through the 24 Hour Surgery. Pegasus Health was founded over 25 years ago around organised general practice and based on the ethos of partnering for the better outcome of patients in Canterbury. Today, with general practice still at our core, we partner with hundreds of organisations and groups across professions, communities and the regional and national healthcare system to support General Practice teams to provide the best outcomes for their patients and advocate for and represent primary care at regional and national levels. We work closely with professional groups to provide an integrated approach to patient care and ensure our communities are provided with services to support improved access and equitable healthcare for all. Click on the graphic to find out how we work with our partners. General practice remains at the heart of primary care, enhanced by many services provided by community based organisations. 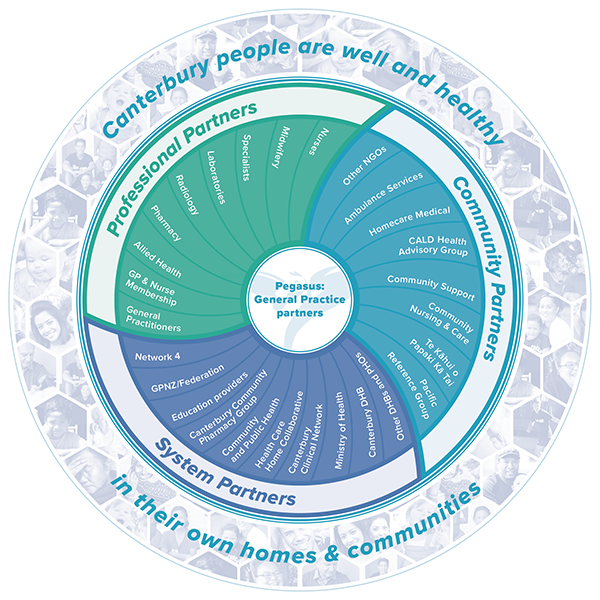 We partner with numerous community groups and organisations to ensure the people of Canterbury have the best access to healthcare and information to help them manage their health and wellbeing. Good health outcomes require an integrated approach. We work closely with many professional groups to provide services that support primary care. Healthcare today requires many systems working together collaboratively. We work closely with government departments and agencies, DHBs and PHOs, professional bodies and education providers to develop and provide services, advocate for primary care needs and ensure general practice teams and primary care providers are up to date with the latest in clinical education and health information. 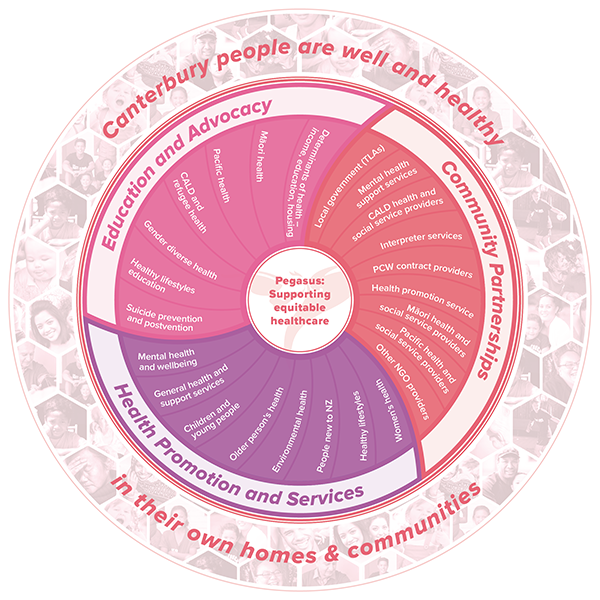 Pegasus Health is a primary care network, providing leadership, support and services to general practices and community organisations with the aim of ensuring Canterbury people are well and healthy in their own homes and communities. For over 25 years Pegasus Health has provided services and supports for general practices in Canterbury. Today, with general practice teams still at our core, this range of services has grown substantially for our GP and nurse members, PHO affiliated practices and general practice teams located from Kaikoura through to Ashburton. Providing optimal patient care requires a continued focus on learning and development. At Pegasus we are proud of our learning and development programme which incorporates our gold standard small group programme as well as clinical skills training, leadership and competency training, Admin and practice management education and more recently, our GPs as Leaders programme. Pegasus would not exist in its current position without its strong membership base that incorporates both GP and Practice Nurses. We have a clinically led governance structure that ensures our membership focus remains at the forefront of our activities and its collective voice is represented on a regional, national and international level. Pegasus provides a range of services to support the smooth running of a general practice. From IT including infrastructure, the Sirius electronic medical system and help desk functions, 24 hour medical care for their patients, nursing support, through to advice on compliance and services to manage their workforce requirements. Since Pegasus merged with Partnership Health and took over the provision of PHO functions, our services and supports direct to the community have grown considerably. We are driven by the notion of equitable healthcare for all and provide the following services and supports in the aim of achieving this. Click on the graphic to find out how we do this. We provide education and advocacy for determinants of health, indigenous and minority groups including Maori, Pacific, CALD and refugee and gender diverse people, have a strong involvement with suicide prevention and postvention and champion causes such as water only in schools. None of these activities or services would be possible without the strong support of our many community partners. We partner with a wide range of organisations, groups and agencies including local government, mental health supports, interpreter services, health and promotion service providers, Maori, Pacific and CALD health and social service providers, our contract providers who support the delivery of our Partnership Community Workers service as well as a range of other NGOs. We provide a range of services directly in the community to support health and wellbeing, interpretation and counselling services for refugees and people from various cultures, support for reintegration from prison and right service right time. Our vision is that we are an international centre of excellence for the development and provision of primary and community based healthcare. Our mission is to achieve improved health through high performing teams and innovative community and primary healthcare. Clinically led and Independent in our advocacy. The creation or development of or the enhancement of co-operation with other entities that have similar objects. The references to Canterbury in this constitution means the area within the jurisdiction of the Canterbury District Health Board pursuant to the provisions of Schedule 1 of the New Zealand Public Health and Disability Act 2000 or such larger areas as may be determined by the Board.